Was there really a vampire who fed on dinosaur blood? Prepare to be confronted with something scarier (and cuter) than Jurassic Park's raptors. In the mid to late Jurassic, the world was full of furry, flying vampire pterosaurs who fed on dino blood. The Jeholopterus was a small pterosaur who was found in Northeastern China. Though originally identified as an insect-eater, an odd mystery about the animal eventually led one researcher to suggest the creature was actually feeding on the blood of nearby sauropods. Let's take a look at the discovery of Jeholopterus, and what spurred great debate over whether it was a blood-sucker. 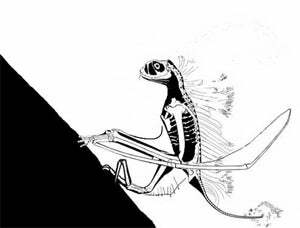 The top image is artist Maija Karala's interpretation of Jeholopterus. Researchers at the Chinese Academy of Sciences published the journal article A nearly complete articulated rhamphorhynchoid pterosaur with exceptionally well-preserved wing membranes and "hairs" from Inner Mongolia, Northeast China. The paper recorded the discovery of a new pterosaur, Jeholopterus ninchengensis. The researchers named the pterosaur for the area of its discovery, Ningcheng County of Inner Mongolia. 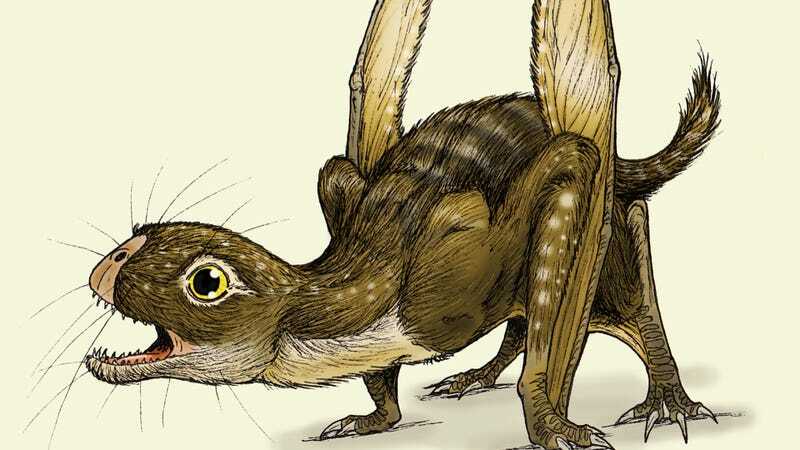 The wingspan of Jeholopterus is a little less than three feet and the pterosaur likely weighed in around five to ten pounds - a little smaller than the average Barn Owl. Several fibers of "hair" are seen among the wings and body in the specimen, along with imprints from a large amount of soft tissue. The skull of the fossil is crushed, limiting interpretation of the head. The authors placed Jeholopterus within the Anurognathidae group – a group of small pterosaurs known for feeding on insects. But Jeholopterus, unlike most pterosaurs, does not have a long beak. This absence played into speculation about Jeholopterus' interactions with dinosaurs. In the 2003 article The Chinese vampire and other overlooked pterosaur ptreasures published in the peer-reviewed Journal of Vertebrate Paleontology, David Peters observed a couple of unusual features in Jeholopterus separating it from the average Jurassic pterosaur. Peters is not a practicing archaeologist, but an art director and natural history writer with several peer reviewed journal articles under his belt. Peters did his work using a scanned and enlarged image of the Jeholopterus fossil uncovered by the researchers at the Chinese Academy of Sciences. Using imaging techniques and Photoshop, Peters created tracings of the Jeholopterus specimen in order to elaborate on the soft tissue features of the pterosaur and the skull, as the one in the fossil is crushed. It is important to note Peters did not examine the fossil itself, only images of the fossil. In this analysis, Peters reconstructed the skull, observing elongated teeth akin to like pliers, a fortified palate able Jeholopterus to deliver a swift blow and powerful blow, a possible mechanism by which the teeth could be locked into place after a strike. Additionally, Peters observed a horse-like tail possibly used to swat away small insects. The pterosaur seemed to have the ability to deliver a strong blow, plus it had fangs — and a method to lock the fangs into another animal after striking. All these features led Peters to suggest Jeholopterus latched onto the backs of sauropods and lapped up blood from fang wounds. Peters doesn't offer any reasons for vampiric behavior — he simply offers it as a physiological possibility. Not all paleontologists are fans of Peters' methods. Christopher Bennett, a Professor at Fort Hays State University, assails Peters' conclusions in the article Pterosaur Science or Pterosaur Fantasy? Bennett points out that several fellow paleontologists are unable to independently repeat the imaging techniques leading to evidence for vampirism. Additionally, Bennet notes several paleontologists are uncomfortable with Peters' separation from the fossils themselves, as Peters performs most of his work without observing the fossils in person. The inability for other paleontologists to reproduce Peters' findings using the same techniques calls the vampirism into question. Can we Prove That Jeholopterus Slurped Vital Fluids? Honestly, without a living Jeholopterus to observe, we really cannot be sure of its unique attributes. That said, I would certainly feel more comfortable about accepting the vampire Jeholopterus view if a number of other interested parties reproduced Peters' results. What is interesting in this situation is the use of non-traditional imaging techniques by someone outside of the world of traditional paleontology to inform the world of academia, regardless of widespread acceptance. Think of it as citizen science on an extreme level - David Peters is making important contributions, even if he's succeeding only in rattling the cage of the academic mainstream. Images from David Peters/CC and Alexander Kellner/CC. Sources linked within the article.